The Most Popular Holiday Lighting Kit- Cool White 150Ft 2-Wires LED Rope Light are versatile and nearly limitless in use for both residential and commercial lighting projects. Sub-miniature bulbs encased in PVC tubing which is with enhanced durability and flexibility to bend into shapes. 2-Wires features steady lighting yet power saving. Suitable for decorating or illuminating your home or business, creating figure or building sign display in many occasions such as corners, ceilings, staircases, decks, driveways, boats, galleries, clubs and parties. All of our rope lights are guaranteed to be the highest quality. Great for indoor and outdoor use! 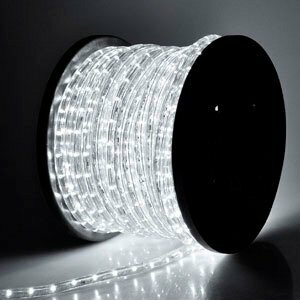 This LED rope light is your must-have decor for holidays and parties. If you have any questions about this product by OEM Control, contact us by completing and submitting the form below. If you are looking for a specif part number, please include it with your message.